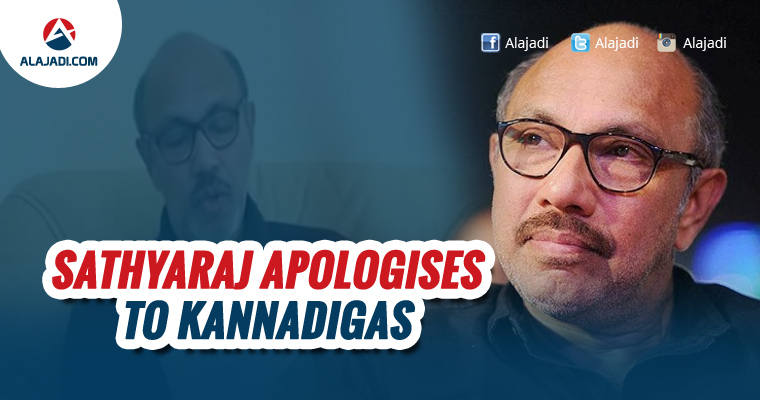 Finally Baahubali Actor Sathyaraj Released apology video for his comments against Kannadigas which he made nine years back during a protest organised by Nadigar Sangam. His apology comes a day after Baahubali’s director Rajamouli released a video statement appealing pro-Kannada organisations not to stall the film. Rajamouli had said that it was unfair to target a movie because of one individual’s personal opinion. Thus paving way for the trouble-free release of the movie Baahubali 2 in Karnataka. Sathyaraj, who plays the role of Kattappa in the multi-lingual drama, made the alleged anti-Kannada comments during the Cauvery row between Tamil Nadu and Karnataka about nine years ago. Sathyaraj is from Tamil Nadu. In the last nine years, I have acted in at least 30 movies including Baahubali, that have released in Karnataka. I have also been offered many Kannada films, which I couldn’t take up because of schedule issues, Sathyaraj said. People have watched that video from nine years ago on Youtube now, and they have been hurt by it. I apologise for the certain words I used for the people of Karnataka, he said. Though Sathyaraj expressed his regret that his actions were held against a movie that thousands of people have put in a lot of hard work, he requested directors and producers who don’t want any trouble to their films for casting him in the future to stay away, since he would continue to voice his opinion for various issues such has the cauvery isse, farmers issue and more for the Tamil people. He also said that he is more proud to live and die as a Tamilian rather than an actor.